We have a lot of talented and interesting people working on the Ares I-X mission and we don’t take enough opportunities to introduce them to America, so I thought it would be a good idea to take this chance to present an article written by Denise Lineberry about one of I-X’s finest. elements or the inside of a house. If she wasn’t spending her days working as a designer on the Ares 1-X Crew Module/Launch Abort System (CM/LAS) project, she admits that she would likely be an interior designer. “My kitchen has been four colors in two years,” Hargrove said. But interior design doesn’t have quite the impact that designing for a back-to-the-moon rocket does. “I am really inspired by the manned space program, and I love the attitude around a research center,” she said. As a member of the NASA Langley Speaker’s Bureau, she enjoys sharing her work experience with classrooms of children. “The children get really excited, and everyone raises their hands to ask a question and I often abandon what I prepared to talked about,” Hargrove said. She has been a member of the Society of Women Engineers since her freshman year in college. Her membership has led her to schools and events such as a Girl Scout Engineering Patch Day, which is held every October. Hargrove was motivated as a child. She grew up in Austin, Texas, and was raised in a family that valued education. 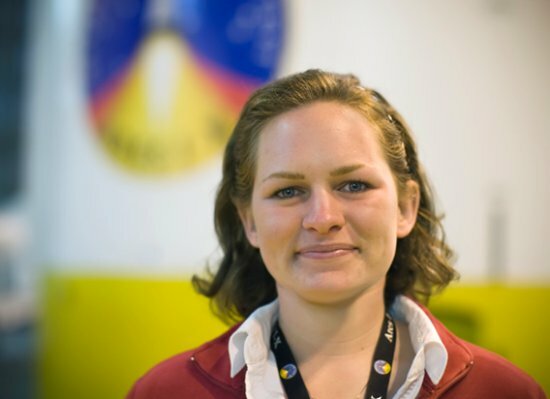 Hargrove earned her BSME from the University of Texas, and she is pursuing her master’s degree in aerospace engineering at Georgia Tech. “I like to be involved and find out more than what’s just required to do my job. Being exposed to information involving my project and getting access to places where I can learn and see more about what’s going on around NASA is very interesting to me,” she said. Her sister, Leah, who is a year younger, is her only sibling. “Virginia needs to import some good Mexican food,” she said. Hargrove returns to Texas once or twice a year to visit with her family… and the taco shops. Author dnkaniganPosted on March 5, 2009 March 19, 2013 Tags Ares, ares I-X, Constellation.to the moon2 Comments on Meet … Sarah.